A study by Nature Climate Change journal found that temperatures in many office buildings are based on a formula developed in the 1960s that uses the resting metabolic rate of a 154lb, 40 year old man. In other words, the temperatures of office buildings today were determined by the comfort of three-piece-suit-wearing men over half a century ago. The workplace has changed significantly since then but the formula hasn’t. While many men still dress similarly, there’s plenty of men in offices that don’t and women’s office wear has traditionally been a bit more drafty. Further, women tend to have lower basal metabolic rates and are more likely to feel colder than men. With those factors in mind, things can get pretty chilly in the office, especially if you’re a woman. So if you’re freezing in your office, stop suffering and take advantage of the products we’ve rounded up to help you feel toastier. Besides creating a more comfortable work environment, according to The New York Times, it might even help you be more productive. The Lasko #100 MyHeat Personal Ceramic Heater is a perfect way to inject some heat into your office. 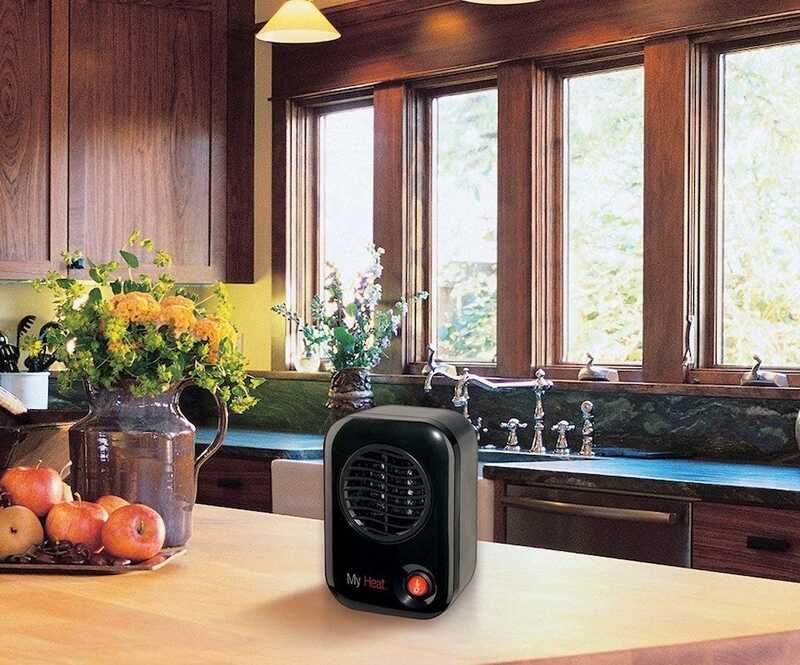 It’s a compact heater that you can easily place under your desk, creating a small pocket of warm air for your legs. Alternatively, it’s small enough that you can even place it on your desk (if you’ve got the space) to take the chill off your hands. The key selling point of the Lasko #100 is that it only uses 200W of energy compared to the 700-1800W beefier space heaters use. While, yes, that means it’s not suitable for heating up an entire conference room 20 degrees it also means there’s no risk of it tripping the circuit breaker in your office, melting anything in your office, and it won’t waste a ton of energy heating the whole room when you really only want to heat your poor icy body. Plus, it’s quiet so it’ll work away during your important conference call without being distracting. Just bear in mind that you’re going to need to be pretty close to feel the benefits. This is a personal heater, not an office heater. Is your office a fairly relaxed working environment where nobody will bat an eye if you wrap a whole blanket around yourself? The Sunbeam Microplush Heated Throw is perfect for such occasions. It looks like a regular blanket, but it offers 3 different heat settings and a 3 hour auto-off function for if you fall asleep while it’s working. Not that you should be falling asleep at work, but if you do at least you won’t bake your internal organs. Snuggly and comforting, you’ll be keen to take it everywhere you go. Its power cord is about 8 foot long so it’s not too restrictive, and it’s sure to keep you toasty at your office (or home) desk. As warm and comfortable as the throw is, however, it’s best to skip it if you work in a public facing position—there’s absolutely no way to look like a professional when you’re wrapped up in an electric blanket. 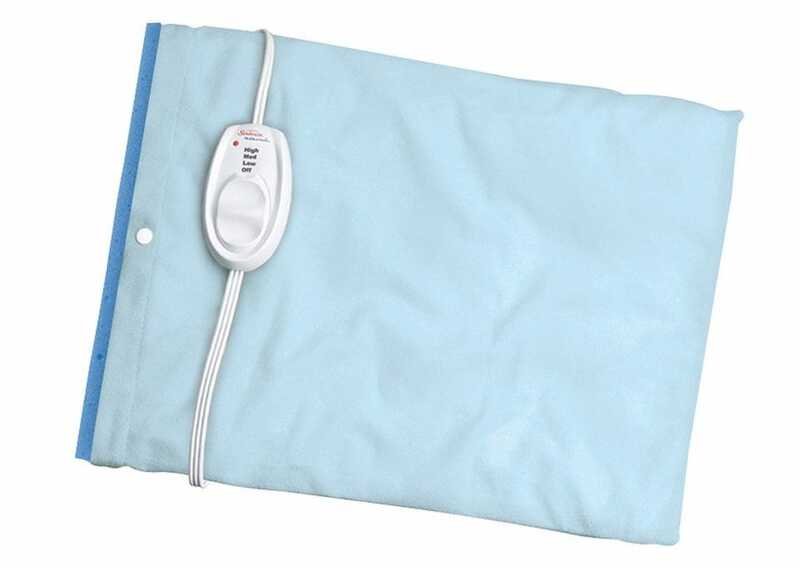 For the office worker who needs to be more discreet with their heating blanket needs, the Sunbeam Moist/Dry Heat Heating Pad is a good alternative to a large throw. 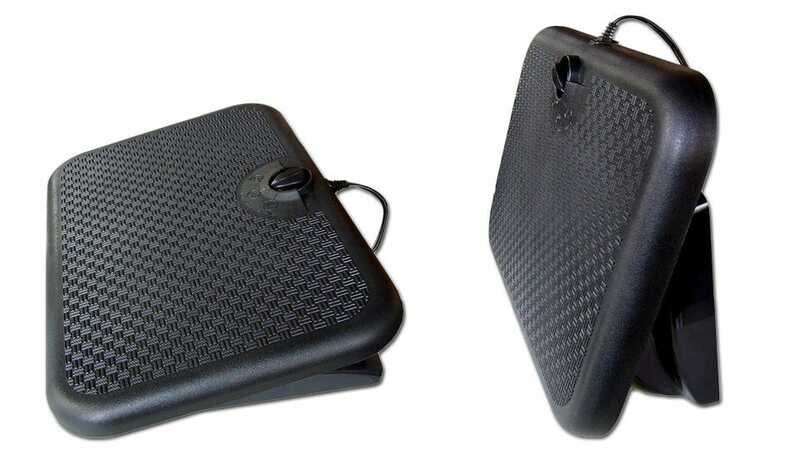 The pad works in two different ways, along with three different heat settings. Its heating technology makes it a great pad to place on sore areas of your body working as a form of heat massage. A sponge insert provides moist heat which can soothe soreness and aches quicker than dry heat alone. Regardless of which way you use it, it works great as a way of warming you up while you’re sitting at your desk, plus it provides natural pain relief. The small size makes it easy to conceal and hardly anyone will notice if it’s resting on your knees or behind your back. 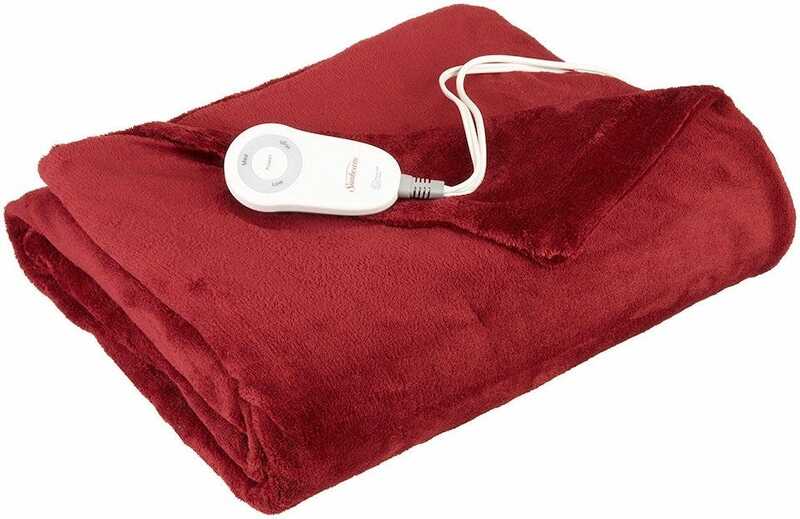 It’s quite the full-body heat experience you get with the aforementioned electric throw, but it’s far more discreet. We’ve written about the virtues of the Toasty Toes Heated Foot Warmer before, and it’s right at home in this roundup. The cutely named heated foot warmer is an ideal addition to your office set up. After all, everyone’s feet are prone to feeling the cold more than most other areas of the body. The Toasty Toes Heated Foot Warmer is energy efficient compared to even a modest space heater (it uses only 90W, less than a bright incandescent light bulb) and will keep your feet suitably warm. The footrest offers three positions, enabling you to place it flat, slightly elevated, or standing upright so as to work as a small under desk heater. You get all the benefits of a foot rest with heat built in the stave off the cold. The only bad thing we can say about the product is that there’s no auto-off switch—so make sure to switch it off after every use. Want something a little more fun than a throw or space heater? Combine your love of being able to feel your fingers and drinking coffee, tea, or other hot drinks with the Toasty Mug Hands Warmer. 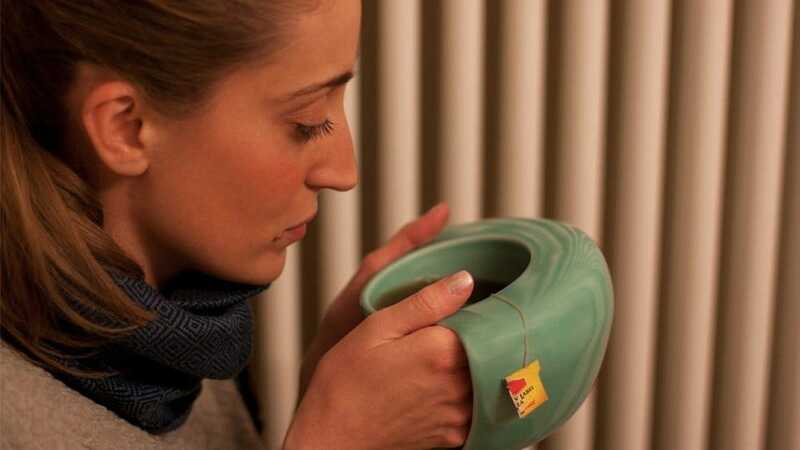 The mug’s clever wrap around design captures the heat of your drink in the shell-like chamber where you can stuff your hands, savoring the warmth while you sip away. It’s original looking, as well as stylish. It’s also an incredibly obvious idea that’ll make you wonder why no one else came up with it years ago. Eschewing technological innovations and gadgetry, it’s possibly the most practical idea on this list. Every console has a handful of unique games that you can’t get anywhere else. If you’re shopping for games for your new PS4, these games should go on the top of your list.